Fathom – Feminism in Israel | Women in Israel – a revolution halted? Fathom > February 2018 > Feminism in Israel | Women in Israel – a revolution halted? 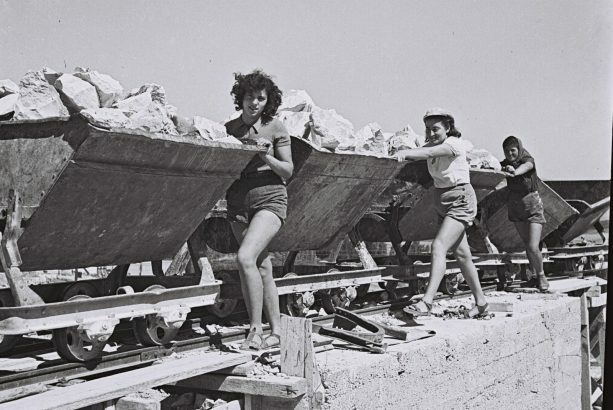 Kibbutz members working at the stone quarry of kibbutz Ein-Harod, 1941. Photo by the Government Press Office. Flickr. In this careful mapping of the terrain, Dahlia Scheindlin examines whether the forward march of women in Israel has been halted. She charts early revolutionary advances, assesses the scale of recent retreats under the pressures of religious power, war and male violence, and identifies the emergence and examines the prospects of new feminist voices in Israel today. During a single week last June, four women were murdered in Israel, all allegedly by people they knew. The violence sparked an outcry, plans for demonstrations, and accusations that the government and law enforcement agencies do not sufficiently protect women’s lives. Global indices show that Israel has a higher rate of women homicide victims as a portion of all murders, than Pakistan, Indonesia, Iran, Mexico and the US, although lower than some Western European countries. For a country that used to pride itself on advances for women, and still views itself as a leader in the region regarding women’s rights, the incidents are a grim reminder that all is not well. One of the most popular romantic images of Israel’s earliest years was a thrilling level of gender equality relative to the times. Bronzed men and women working the kibbutz fields together beamed from black and white photos that circulated around the world. Women’s army service was a particular point of pride: it made them full participants in the project of Jewish national redemption, while making Israel itself an avant-garde society. And men revelled in the sensuality of ‘chicks with guns’. By 2017, these myths have been largely deprived of meaning. Revolutionary equality was supplanted by gender hierarchies generated by perennial war; in a military-obsessed society, the man is king. Chicks with guns turned into teens with staplers in the hit 2014 film Zero Motivation about women soldiers so bored they slowly crack up. Further, the main source of the gender equality myth emerged from the fields of agriculture and army service, Jewish arenas that left out Israel’s Arab women citizens entirely. The gender equality myth appears to have gone the way of the tired notion of Israel as a valiant little David, victorious over a sea of scary Goliaths. A New York Times opinion article by MK Michael Oren celebrating the fiftieth anniversary of the Six-Day War, also from June 2017, repeated that crusty storyline. Perhaps it’s no coincidence that the article was adorned with a photo of women soldiers captured in coquettish, almost fetishised angles – highlighting the obsolescence of both. At present, the number of women in public and social life in Israel is unremarkable, at best. Further, there is little sense of breakthrough feminist progress in politics. The days of a woman prime minister are long forgotten; any lingering feminist message of Golda Meir’s leadership has been overshadowed by the memory of a military disaster on her watch, the 1973 Yom Kippur War. To this day, mastery of security affairs confers authority; the IDF is by far the most trusted institution in Israel among Jews, every year. And since men are dominant in the military world, men – particularly older ones – boast an air of authority, and often a sense of entitlement. Women make up just 27 per cent of Israel’s Knesset, and that’s a record high. For parliamentary representation Israel trails Bolivia, Cuba, South Africa, Spain, Belarus and Afghanistan, the OECD average and the UK too (although still ahead of the US). On the number of key ministers and municipal leaders, Israel performs even worse. Like many Western countries, Israel’s workforce is characterised by gender wage gaps. This is not only due to women working fewer hours, but reflects lower average hourly rates for women and men’s work – which in turn reflects over-representation of women in lower-paying employment, according to a 2014 report by the Adva Center, a respected think tank. Gaps are even higher among higher educated and managerial levels in Israel. But what really sets Israel apart from the other Western countries also facing such gaps is captured in the first, telling line of the report: ‘There is little public debate in Israel about the salary gaps between men and women.’ It’s worth pointing out that the debates that do happen include ‘mansplaining’ on overdrive. An article in January 2018 on the right-wing portal Mida categorically declared that pay gaps are both non-existent, and opposing them is the true chauvinism. The writer is a 36-year old male whose twitter profile states only ‘I write what I think’. Beyond politics and economics, women are routinely absent from culture: all-male news panels and conference line-ups are common. Not a single woman was named in the recently-published list of winners of the prestigious 2017 Emet Prize for arts, science and culture (nor any Arabs). In 2018 the symbolic women’s role in the Jewish (only) national cause of state building has become atrophied around motherhood. Certainly in times of crisis (though not exclusively in crisis) women are very commonly portrayed as the worried or grieving mothers and wives of soldiers – an image and a reality that is not at all limited to the right-wing. Some believe Israel has symbolically turned women into the replenisher of the Jewish people following the past. Shira Richter is a feminist activist-artist (in her words, a ‘matricentric feminist artivist’); she believes women in Israel are viewed as the bulwark against future existential, largely demographic, threats. Social veneration of motherhood is reinforced by unusually generous state support for in vitro fertilisation, including subsidies after the ages when the chances plunge. Israeli Jewish women have the highest total fertility rate in the OECD, including moderate rises among secular Jewish women – so that growth cannot only be attributed to the statistical influence of religious and ultra-Orthodox birth rates. Single motherhood is increasingly acceptable even among religious Jews. While it is laudable that women have more options and encounter growing acceptance for their choices, the ultimate social premium on motherhood still places a burden on women who prefer other directions, or steers them away from other paths in life. The unwritten social norms of motherhood in Israel start with the assumption that all women from their mid-20s have children, and if not, they are assumed to be ashamed and desperate, probably in need of unsolicited advice, from men. Why did Israeli feminism plateau? ‘I would go further: we’re falling behind.’ Frances Raday told me bluntly. A Professor Emerita from Hebrew University, Raday is a legal scholar who specialises in human rights and economic aspects of gender equality in Israel and around the world, with a focus on religion and gender. In her view, Israel is not just experiencing a natural slowdown of progress on gender. She traces the roots of the problem to the original tension between Jewish religion and secular democracy in Israel. A fateful compromise in the early days of statehood left personal status – marriage, divorce, including custody and alimony, burial and inheritance, in the hands of Jewish rabbinic authorities (or the institutions of Israel’s other main religions). ‘Relegating women to religious communities is a gaping black hole,’ she says, regarding feminist progress from Israel’s early years. ‘It subsumed a lot of the gains that women made. They see women’s right to equality as secondary to all other goals of the state.’ Who are ‘they’? The Rabbinate, certainly, but it’s the elected government which enforces what is known as the ‘status quo’. Raday believes the population – including women – have internalised the notion that equality is less important than other national goals. ‘This deference to ethnic religious Judaism rather than self-determination of Jews’ she views as ‘general malaise [that] absorbed the other values of justice in society, and primarily equality’. If Raday thinks ethnic Jewish religiosity sowed the seeds of gender inequality from the start – Richter, the feminist-artist, blames the ongoing culture surrounding active military conflict. In her view, wars are responsible for the physical, emotional and material discrimination that women take for granted as their lot. ‘Most of these years, we’ve had the attitude of “shut up, we’re shooting” [a well-known expression in Israel]. Men to go war, and another five years of progress go down the drain.’ The reasons are manifold, and they start with women filling in as the everything-parent while the men are serving. ‘It takes attention, time, energy, resources. Women lose their jobs … [or] they lose days at work, don’t get compensation, or recognition, and when the man comes home she helps with his trauma. Domestic violence always goes up during wars.’ Indeed, Knesset testimony in 2002 cited the global phenomenon linking war to domestic violence, and statistics during the last Gaza War support Richter’s point. Further, military machoism and religious dominance collide in the increasing attempts at gender segregation in an increasingly religious army – stamping out traces of even the erstwhile image of equality through the military. Still, Israel does have a vibrant feminist past, which has seen some major successes. The early years of statehood saw the creation of women’s support organisations such as the Israel Women’s Network that are now well established. Women have been prominent in the anti-war and anti-occupation movements through organisations such as Women in Green, Four Mothers, Machsom Watch and most recently, Women Wage Peace. Sexual harassment legislation from 1998 began the long road of raising consciousness on a fraught, widespread problem. Still, Richter thinks that only recently has the word ‘feminist,’ become legitimate – including in the eyes of women – which, if true, puts Israel psychologically decades behind their American counterparts. 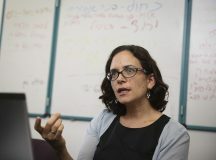 If the revolutionary spirit of feminism in mainstream Jewish Israeli society seems in danger of stagnating, new trends are increasingly emerging from surprising quarters. For some years, over half of Arab higher education students have been women – as much as 66 per cent in 2015, according to the Israel Women’s Network. A 2015 report by the Ministry of Science, Technology and Space observed that Arab girls qualify for high-school level for math, technology, engineering at higher rates than boys, and study for additional math and science credit at higher rates than Jewish girls, sometimes Jewish boys. They are participating in professional training programmes at higher rates than men. Arab women have been raising awareness of the problem of violence in Arab society, often directed against them – approximately half of the women murder victims are Arab – and fighting sexual harassment through increasingly public campaigns. The recent film In Between is an electric portrayal of the dilemmas faced by Arab women inhabiting a range of new roles; a stark contrast to the ennui of Jewish women soldiers in Zero Motivation. Another surprising locus of activity is the Haredi community – the very group that maintains total control over the Rabbinate. In a world known for strict gender roles and isolation from both state institutions (other than the national welfare system) and society in general, women have commonly worked to prop up families in which the man studies Torah. But in recent years, some Haredi women have been advancing into more professional fields: accounting, law, architecture, high tech. 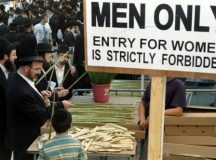 Five hundred Haredi women entrepreneurs signed up for a women’s section on a local campus near Mea Shearim, according to a 2015 article, up from 37 just two years earlier. There too, women have been organising to expose and raise awareness of sexual harassment in this deeply insular world. Political activism is bubbling, and in 2015, Haredi women formed their own political party, which got few votes but plenty of buzz. And within more mainstream society, there has been something like a revived discourse emanating largely from the media. The Women’s Journalist Caucus was formed in 2012, and one of the first major outcomes was to expose sexual harassment cases among top Israeli media personalities. In 2016, so many women publicly came forward with tales of sexual assault and harassment – in the army, the police, clubs, bars and courts – that I wrote about these women as the ‘Story of the Year’. And in late 2017, of course the #MeToo campaign did not pass over Israel, opening up powerful discussions about long overdue re-calibrations of gender relations. Some of these trends are still nascent. It’s not clear whether women are the vanguard leading their conservative communities and institutions to a transformative moment, or part of slow, incremental changes, inching forward. But perhaps these newer trends will bring back the drive and activism for gender equality – badly needed in all parts of Israeli society.